Steve Bannon will reportedly testify privately in front of the House Intelligence Committee Tuesday. Former White House chief strategist Steve Bannon is reportedly expected to testify privately in front of the House Intelligence Committee on Tuesday. Lawmakers will likely question him about comments attributed to him in Michael Wolff's book "Fire and Fury: Inside the Trump White House." Bannon also told Wolff he thought the special counsel's investigation into Russian meddling in the 2016 presidential election would likely zero in on money laundering and said, "They're going to crack Don Junior like an egg on national TV." Since the book's release, Bannon stepped down as the head of Breitbart News. Bannon might also get questioned about the presidential transition. 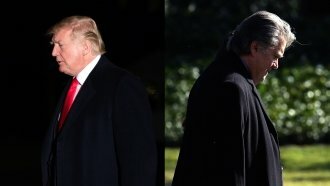 The New York Times reported pre-inauguration emails from President Donald Trump's transition team indicated Bannon knew former national security adviser Michael Flynn was in contact with the Russian ambassador. Beyond Robert Mueller's probe, the House Intelligence Committee is one of multiple congressional panels investigating Russian meddling and potential links to the Trump team.